Fish are an important model for the pharmacological and toxicological characterization of human pharmaceuticals in drug discovery, drug safety assessment and environmental toxicology. However, do fish respond to pharmaceuticals as humans do? To address this question, we provide a novel quantitative cross-species extrapolation approach (qCSE) based on the hypothesis that similar plasma concentrations of pharmaceuticals cause comparable target-mediated effects in both humans and fish at similar level of biological organization (Read-Across Hypothesis). To validate this hypothesis, the behavioural effects of the anti-depressant drug fluoxetine on the fish model fathead minnow (Pimephales promelas) were used as test case. Fish were exposed for 28 days to a range of measured water concentrations of fluoxetine (0.1, 1.0, 8.0, 16, 32, 64 µg/L) to produce plasma concentrations below, equal and above the range of Human Therapeutic Plasma Concentrations (HTPCs). Fluoxetine and its metabolite, norfluoxetine, were quantified in the plasma of individual fish and linked to behavioural anxiety-related endpoints. 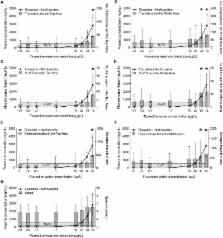 The minimum drug plasma concentrations that elicited anxiolytic responses in fish were above the upper value of the HTPC range, whereas no effects were observed at plasma concentrations below the HTPCs. In vivo metabolism of fluoxetine in humans and fish was similar, and displayed bi-phasic concentration-dependent kinetics driven by the auto-inhibitory dynamics and saturation of the enzymes that convert fluoxetine into norfluoxetine. The sensitivity of fish to fluoxetine was not so dissimilar from that of patients affected by general anxiety disorders. These results represent the first direct evidence of measured internal dose response effect of a pharmaceutical in fish, hence validating the Read-Across hypothesis applied to fluoxetine. Overall, this study demonstrates that the qCSE approach, anchored to internal drug concentrations, is a powerful tool to guide the assessment of the sensitivity of fish to pharmaceuticals, and strengthens the translational power of the cross-species extrapolation. Adverse outcome pathways: a conceptual framework to support ecotoxicology research and risk assessment. Ecological risk assessors face increasing demands to assess more chemicals, with greater speed and accuracy, and to do so using fewer resources and experimental animals. New approaches in biological and computational sciences may be able to generate mechanistic information that could help in meeting these challenges. However, to use mechanistic data to support chemical assessments, there is a need for effective translation of this information into endpoints meaningful to ecological risk-effects on survival, development, and reproduction in individual organisms and, by extension, impacts on populations. Here we discuss a framework designed for this purpose, the adverse outcome pathway (AOP). An AOP is a conceptual construct that portrays existing knowledge concerning the linkage between a direct molecular initiating event and an adverse outcome at a biological level of organization relevant to risk assessment. The practical utility of AOPs for ecological risk assessment of chemicals is illustrated using five case examples. The examples demonstrate how the AOP concept can focus toxicity testing in terms of species and endpoint selection, enhance across-chemical extrapolation, and support prediction of mixture effects. The examples also show how AOPs facilitate use of molecular or biochemical endpoints (sometimes referred to as biomarkers) for forecasting chemical impacts on individuals and populations. In the concluding sections of the paper, we discuss how AOPs can help to guide research that supports chemical risk assessments and advocate for the incorporation of this approach into a broader systems biology framework. Zebrafish behavioral profiling links drugs to biological targets and rest/wake regulation. A major obstacle for the discovery of psychoactive drugs is the inability to predict how small molecules will alter complex behaviors. We report the development and application of a high-throughput, quantitative screen for drugs that alter the behavior of larval zebrafish. We found that the multidimensional nature of observed phenotypes enabled the hierarchical clustering of molecules according to shared behaviors. Behavioral profiling revealed conserved functions of psychotropic molecules and predicted the mechanisms of action of poorly characterized compounds. In addition, behavioral profiling implicated new factors such as ether-a-go-go-related gene (ERG) potassium channels and immunomodulators in the control of rest and locomotor activity. These results demonstrate the power of high-throughput behavioral profiling in zebrafish to discover and characterize psychotropic drugs and to dissect the pharmacology of complex behaviors. Understanding behavioral and physiological phenotypes of stress and anxiety in zebrafish. The zebrafish (Danio rerio) is emerging as a promising model organism for experimental studies of stress and anxiety. Here we further validate zebrafish models of stress by analyzing how environmental and pharmacological manipulations affect their behavioral and physiological phenotypes. Experimental manipulations included exposure to alarm pheromone, chronic exposure to fluoxetine, acute exposure to caffeine, as well as acute and chronic exposure to ethanol. Acute (but not chronic) alarm pheromone and acute caffeine produced robust anxiogenic effects, including reduced exploration, increased erratic movements and freezing behavior in zebrafish tested in the novel tank diving test. In contrast, ethanol and fluoxetine had robust anxiolytic effects, including increased exploration and reduced erratic movements. The behavior of several zebrafish strains was also quantified to ascertain differences in their behavioral profiles, revealing high-anxiety (leopard, albino) and low-anxiety (wild type) strains. We also used LocoScan (CleverSys Inc.) video-tracking tool to quantify anxiety-related behaviors in zebrafish, and dissect anxiety-related phenotypes from locomotor activity. Finally, we developed a simple and effective method of measuring zebrafish physiological stress responses (based on a human salivary cortisol assay), and showed that alterations in whole-body cortisol levels in zebrafish parallel behavioral indices of anxiety. Collectively, our results confirm zebrafish as a valid, reliable, and high-throughput model of stress and affective disorders. Competing Interests: This work was co-funded by the AstraZeneca Global Environment research programme. SFO is an employee of AstraZeneca; RIC, MJW and GHP were also AstraZeneca employees. AstraZeneca is a biopharmaceutical company specialized in the discovery, development, manufacturing and marketing of prescription medicines, including some anxiolytic products. This does not alter our adherence to all the PLoS ONE policies on sharing data and materials. Conceived and designed the experiments: LM-C SFO GHP MR-W JPS. Performed the experiments: LM-C SFO RIC AdP. Analyzed the data: LM-C SFO RIC AdP MJW GHP MR-W JPS. Contributed reagents/materials/analysis tools: SFO RIC MJW GHP MR-W JPS. Contributed to the writing of the manuscript: LM-C. Critical review and revision of the manuscript: SFO AdP MJW GHP MR-W JPS. This work was funded by a Biotechnology and Biological Sciences Research Council (BBSRC) Research Grant (BB/100646X/1), co-funded by the AstraZeneca Global Environment research programme, to JPS and MR-W supporting LM-C. AdP was supported by the Isambard Scholarship awarded by Brunel University. BBSRC had no role in study design, data collection and analysis, decision to publish, or preparation of the manuscript. SFO is an employee of AstraZeneca; RIC, MJW and GHP were also AstraZeneca employees. AstraZeneca provided support in the form of salaries for authors SFO, RIC, MJW and GHP and grant to JPS and MR-W supporting LM-C, but did not have any additional role in the study design, data collection and analysis, decision to publish, or preparation of the manuscript. The specific roles of these authors are articulated in the ‘author contributions’ section. Data Availability The authors confirm that all data underlying the findings are fully available without restriction. The authors confirm that all the data underlying the findings are fully available from the Dryad database. DOI: 10.5061/dryad.b1772. Anti-depressant effects of Xiaoyaosan on rat model of chronic unpredictable mild stress: a plasma metabonomics study based on NMR spectroscopy. Fluoxetine treatment affects nitrogen waste excretion and osmoregulation in a marine teleost fish.